A powerful Saturn V rocket launches the Apollo 11 mission toward space in 1969. So you've caught the latest news about Elon Musk or Jeff Bezos, or you've dug through the history books and discovered why Robert Goddard and Wernher von Braun were such legends, and you've decided you want a piece of the rocket-building action to call your own. Well, read on. I should note that the following text is just a poor astrophysicist's approach to building rockets, and obviously leaves out a lot of…well, let's just call them "critically important details." Rockets are some of the most complex creations ever achieved by humanity, and it takes just a tiny bit more description to really flesh them out —my scientist hat goes off to the brave engineers who go to the trouble of actually designing and building them. When moving on the surface of the Earth or through the air, we rely on conservation of momentum to propel us forward. When we push against the ground or flap wings against the air, the ground or air pushes back on us. Since Earth is somewhat larger than us, conservation of momentum means that we get to move a lot while the bulk of our planet barely budges. But outer space is a different story. In that cold vacuum, there's nothing to push against. Feet, wings, propellers and jets are useless. But, that doesn't mean that conservation of momentum suddenly stops existing. Instead, to make forward progress we essentially have to carry our own momentum with us. It's the same principle that holds if you're on an icy lake or in a rolling office chair. If you take a part of the mass that you carried with you from the beginning (a shoe, a snowball, throwing stars, whatever) and toss it away from you, you'll move in the opposite direction. That little thing you tossed away will be smaller than you, so you won't exactly move a lot, but you went somewhere. So, to have a successful rocket in space, you need to carry your propellant with you in a box. The propellant can be anything, and if it gets tossed out the back end of the rocket, you're bound to move forward. Progress! But the strategy of "put your propellant in a box and punch a hole in back" probably isn't going to be the most efficient. That's why you need to replace your hole with a nozzle: specifically a de Laval nozzle, named after its inventor, Gustav. This particular nozzle tapers down to a narrow throat, then widens into a bell-shaped exhaust, where the output is much larger than the input. The unique shape does something magical to the flow of the propellant, as Goddard found to his surprise and delight in the early 1900s. As the propellant enters the narrow throat, it speeds up. That's because the fluid behaves as if it's incompressible — it can't squeeze down any smaller. So to keep the total mass flowing at the same rate, it has to switch from "wide and slow" at the entrance to "narrow and fast" in the middle. Every substance has its own sound speed (the speed that sound waves naturally travel through it) and if you design your throat just right, the fluid will become sonic, traveling at that sound speed right at the narrowest point of the nozzle. And sonic and supersonic fluids have a special property that's the opposite of their subsonic cousins: Instead of slowing down as they re-expand, due to the complexities of fluid dynamics, they speed up. So as the fluid exits the nozzle, it gets an additional boost. Plus, the special bell shape of the exhaust end allows the exiting fluid to keep pressing up against its enclosure, giving an extra momentum boost on the way out. So you've got your propellent, and you've got your nozzle. What's left? That's right, you need something to power the whole thing: a source of energy, which you also usually need to pack with you. In the case of throwing things on slippery ice, you brought your energy in the form of breakfast, which you consumed earlier in the day and stored for later use. But cereal and milk isn't the best energy source for space-going power, which is why chemical rockets have proven so successful. By creating a potent mixture of a fuel (say, highly refined kerosene) and an oxidizer (like the eponymous oxygen), incredible energies can be released and harnessed in the ensuing exothermic reactions. Other combos are available, of course, and in some cases the fuel self-ignites under the right conditions or exists in solid form before the main event. Either way, the result is the same. Another handy thing about chemical rockets is that the fuel also serves as a propellent — the results of the energetic reactions are shoved into the de Laval nozzle, pushing the rocket forward. That's nice. But it's the fact that you have to carry your own fuel and energy source that limits what a rocket can do. This is governed by the "Rocket Equation," a simple relationship between the energy needed to reach your destination, the energy available in the fuel, and the fraction of the total rocket mass used up by fuel. If you want to go farther or heave a heavier object to orbit, you need more fuel. But more fuel adds more weight, making it much harder than you expect to get a lift. 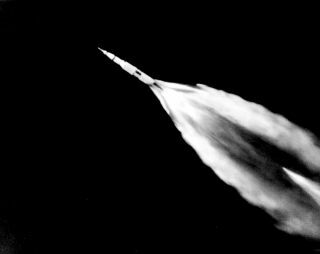 It's this "tyranny" that explains why modern rockets are in the range of 80 to 90 percent fuel, all used to heft a comparatively small payload into space, and why staging — having multiple rocket stages used during a launch — is such an important concept: By ditching dried-up rocket parts as you go, you become that much more efficient. So there you have it. All the essential ingredients of a rocket: conservation of momentum, a propellant with a fancy nozzle and a source of energy. Even non-standard rockets follow the same basic principles. The "nozzle" could be electric or magnetic fields, and the source of energy could come from a fuel or nuclear reactions or the sun itself. But no matter what, this is the only way to rocket around in space. Learn more by listening to the episode "How do you build a rocket-ship?" on the Ask A Spaceman podcast, available on iTunes and on the Web at http://www.askaspaceman.com. Thanks to @MarkRiepe, Peter, Dan H., and Sayan P. for the questions that led to this piece! Ask your own question on Twitter using #AskASpaceman or by following Paul @PaulMattSutter and facebook.com/PaulMattSutter. Follow us @Spacedotcom, Facebook and Google+. Original article on Space.com.